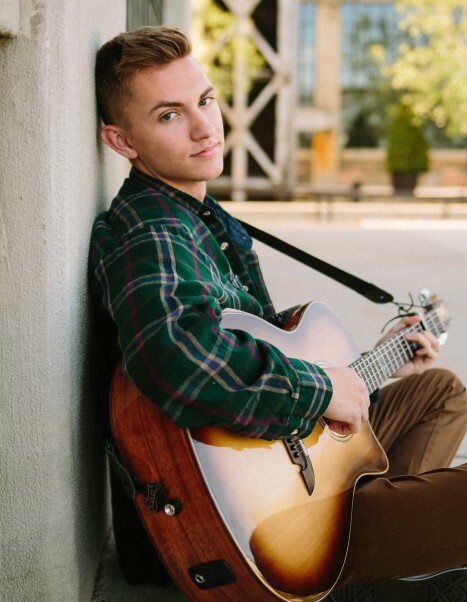 Jacob Marc Collings, born July 28, 1999 to loving parents Marc and Victoria in Pocatello, Idaho returned to heaven on April 13, 2019. The second of four children and only son he was an amazing big and little brother to his 3 sisters, Kenadee, Brinlee and Bailee. He lived his life with passion and enthusiasm but like a warrior he battled in a civil war with his brilliant mind. Jake fought OCD, anxiety and depression on a daily basis and we are so privileged to be a part of this valiant warrior’s time on earth. Jake was filled with an abundance of talent, friends and love ones. Most days, his brain wouldn’t let him see that. Never an unkind word or a raised voice from him. Always thoughtful, kind, empathic, loving and gentle. He had a brilliant mind – graduating from Weber High School with highest honors and attending Southern Utah University on a presidential scholarship. Jake left us behind the evidence of his brilliance in his music, photos, art work and writings. For that we will be forever grateful. Philosopher, meta-physical explorer and writer extraordinaire. Humor with the brilliance of wit. Soothing singer, strumming guitar player. able to color-in life’s idiosyncrasies. Cave explorer, dreamer so wanting of life’s fullest. Surviving love: His mother, Victoria L. Collings, who loved him like no other and bares the scars fighting along his personal civil war. She puts Beverly Goldberg to shame! His father, Marc A Collings. His greatest fan. Jacob you owe your dad a concert T-Shirt damn-it, please draw one in the stars. His oldest Sister Kenadee Sarah Collings, kindred-kind, soul-sister and fellow warrior. Brinlee Belle Collings, strong, sensitive; his other half. Bailee Kate Collings, Jakes one and only, personal snowman building assistant. His last hug in this life. Grandma and Grandpa Marcia and Dave Collings who saw his true potential. Nana Diana Sue Holland who loved him so deeply. Loving Uncle and Aunt, Todd and Denise Collings with cousins Grace and Jake’s special connection and now official guardian angel to sweet Doug. Uncle Steve and Tracy Collings whose hearts are with from a far with cousins Steve, Jessica, Kaylee and Conner. Uncle Kenney (Aka Chicken) Aunt Sandy and loving cousin Kelton, partner-in-crime Cameron and Maili. Thoughtful, always there, Uncle John and Aunt Molly and kindred cousins: Clara who he always protected, Chloe, Carter “Sauce”, and now guardian angel to Sissy. Family glue Uncle Adam and Aunt Catie with loving cousins: Zoe Bug and Nixon. Fellow adventurers Uncle Chris and Aunt Christina and cousins Korbin, Maylee, and fellow musician cousin Landon. Uncle Chris and Aunt Jacqui and their children; Ben, Josh, Tally, Caroline, Daniel and Ethan. The ultimate best friend Kaden Ashworth, who stuck by his side through thick and thin, just like a brother. Zeus, Jake’s god of cats. Willow and Leila, his puppies, a man’s best friend. Embracing Jake with loving ethereal arms are: Uncle Doug, Grandpa and Grandma Collings, Grandpa and Grandma Kenney, Loving Grandma Loa Jean, Nana and Papa Faichney, Grandma and Grandad Parker and a long line of family. A special viewing will be held from 11:30 am to 1:30 pm Friday April 19th followed directly with a celebration of Jake’s life service at 2:00 pm both events at the Copper Nickle on 2450 Grant Avenue, Ogden UT. Please park across the street. If you know of Jake please do not hesitate to come celebrate his life and remember him with us. If you have any photos of him, please print it off (even on just plain white paper) to post at his funeral. Services entrusted to Lindquist’s Ogden Mortuary. There's still time to send flowers to the Visitation at the Copper Nickel from 11:30 AM to 1:30 PM on April 19, 2019.